Lotus is owned by Proton. Proton took over Lotus after the bankruptcy of former owner Bugatti in 1994. The company was started as Lotus Engineering Ltd. by engineer Colin Chapman in 1952. The first factory was in old stables in Hornsey, North London. Team Lotus was started in 1954. It was split off from the Lotus Engineering company. Team Lotus was active and competitive in Formula One racing from 1958 to 1994. The Lotus Group of Companies was formed in 1959. One company was Lotus Cars Limited which made road cars. The other company was Lotus Components Limited which worked on customer race cars. Lotus Components Limited became Lotus Racing Limited in 1971 but stopped building cars in the same year. In 1959, the company moved to Cheshunt into a factory built to make cars. Since 1966 the company has been in a modern factory and road test facility at Hethel, near Wymondham. This site is the former RAF Hethel base. The test track uses parts of the old runway. Chapman died of a heart attack in 1982 at the age of 54. The car maker built tens of thousands of successful racing and road cars. They won the Formula One World Championship seven times. At the time of his death he was linked with the DeLorean scandal over the use of government subsidies for the production of DeLorean DMC-12 for which Lotus had designed the chassis. In 1986, the company was bought by General Motors. On 27 August 1993, GM sold the company to Bugatti Automobili SpA. In 1996, a majority share in Lotus was sold to Proton, a Malaysian car company. The company is organized as Group Lotus. Group Lotus is divided into Lotus Cars and Lotus Engineering. Lotus Engineering builds suspension for other car builders. They also worked with General Motors to develop the 4-cylinder Ecotec engine. The four letters in the middle of the logo stand for the initials of Anthony Colin Bruce Chapman. The Lotus Cars helped its customers to race its cars. They entered Formula One through its sister company Team Lotus in 1958. In 1960, Lotus got its first win in F1. A Lotus 18 driven by Stirling Moss won at Monaco. The car was entered by privateer Rob Walker. They had big success in 1963 with the Lotus 25. With Jim Clark driving, Lotus its first F1 World Constructors Championship. Clark had a bad crash in a Formula Two Lotus 48 in April 1968. He was killed in the crash. It was a severe blow to the team and to Formula One. Clark was the dominant driver with the best car at the time. He is an important part of Lotus' early years. The 1963 championship was won by Clark's teammate, Graham Hill. Lotus made the mid-engined layout popular for IndyCars. They developed the first monocoque Formula One chassis. They also made the engine and transaxle a part of the chassis. A transaxle is a combination of the transmission and rear axle. Lotus was also among the first in Formula One to add wings and shape the bottom of the car. This created aerodynamic downforce. They were the first to move radiators to the sides of the car. This improved the aerodynamic performance of the car. Lotus also developed active suspension. After Chapman's death, until the late 1980s, Lotus was still to be a major player in Formula One. Ayrton Senna drove for the team from 1985 to 1987. Senna won twice in each year and earned 17 pole positions. By the company's last Formula One race in 1994, the cars were not competitive. Lotus won a total of 79 Grand Prix races. Lotus was the first team to achieve 50 Grand Prix victories. In 1992, Team Lotus started Classic Team Lotus for the Works historic motorsport activity. Classic Team Lotus keeps Lotus F1 cars fixed and in running condition. They race them in the FIA Historic Formula One Championship. It keeps the Team Lotus archive and the Works Collection of cars. It is managed by Clive, Chapman, the son of Colin Chapman. At the end of the 1994 season, Lotus left Formula One racing. 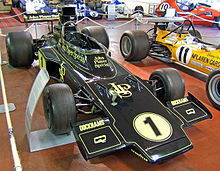 The Lotus name returned to Formula One for the 2010 season. A new team in Malaysia was started called Lotus Racing. They used the Lotus name with licensor from Group Lotus. The new team was unrelated to the old Team Lotus. The new team was funded by a Malaysian Consortium (group of companies) including Proton. Proton is the owner of Lotus Cars. After the 2010 season, Proton ended the license for Lotus Racing to use the Lotus name. Proton believed the team broke the license rules. Lotus Racing then bought Team Lotus Ventures Ltd. This company owned the rights to use the name Team Lotus. The Lotus Racing team announced they would be known as Team Lotus starting in 2011. In December 2010 Group Lotus (Proton) purchased part of the Renault F1 team. They announced the team would be now be known as Lotus Renault GP. Lotus Renault GP will compete in Formula One starting in 2011. At the 2010 Paris Motorshow, Lotus announced five new models. These will be introduced over the next five years. New Lotus Esprit. Due to be released in 2013. The Esprit will be powered by a 5.0 litre Lexus V8 pressure charged engine delivering up to 620 PS, capable of 0 to 100 kilometres per hour (62 mph) in about 3.4 seconds. New Lotus Elan. Due to be release during the second half of 2013. The Elan will powered by a 4.0 litre V6 pressure charged engine capable of delivering up to 450 PS with a weight of 1,295 kilograms (2,855 lb). New Lotus Elite. A 2+2 GT. It has a front-mid positioned 5.0 litre V8 engine producing up to 620 PS, capable of 0 to 100 kilometres per hour (62 mph) in about 3.7 seconds. Due for release in spring 2014. New Lotus Elise. The replacement for the Lotus Elise. It is due in 2015. It will have a 2.0 litre inline 4 pressure charged engine producing up to 320 PS, the Elise 2015 is stated to be capable of 0 to 100 kilometres per hour (62 mph) in less than 4.5 seconds. New Lotus Eterne. A four-door, four seater sports GT. It will have a 5.0 litre pressure charged V8. It was designed to compete with the Porsche Panamera and the Aston Martin Rapide. Lotus Elise: The Elise uses many new engineering techniques, including an aluminum extrusion frame and a composite body shell. The U.S. version was uses a Toyota engine. This is to pass the U.S. emissions laws. The supercharged Lotus SC and limited edition Jim Clark Type 25 Elise have higher performance. They can do 0 to 60 mph (97 km/h) in 4.3 seconds. Lotus Exige: A version of the Elise with a redesigned body to provide additional downforce (100 lb (45 kg) at 100 mph (160 km/h)). Lotus Exige S: An Exige with a supercharged engine providing 220 hp (160 kW) hp. The non-S Exige and Elise have 190 hp (140 kW). Lotus Evora: Launched 22 July 2008. Code named Project Eagle during development. A 2+2 sports car with a mid mounted, transverse 3.5 litre V6 engine. Lotus 2-Eleven: The Lotus 2-Eleven weighs only 670 kg (1,480 lb) and with 252 bhp (188 kW). It can go from 0 to 60 mph (97 km/h) in 3.8 seconds, and has a top speed of 155 mph (249 km/h). Intended as a track day car (a car to be driven only on a race track). Lotus will make the car fully road legal if desired. Lotus T125 Exos: A track-only Formula 1 inspired car. It has a 3.5l Cosworth V8, producing 640 bhp (480 kW). Only 25 cars will be built, and they will cost $1 million each. Lotus Seven (1957–1970): Classic open sports car, without any unnecessary equipment. Designed to handle a racing circuit and nothing else. The rights to the Seven were sold in 1973 to Caterham Cars, who continue to produce it today. Updated versions of this 1957 design are also produced by other firms, including Westfield Sportscars and Donkervoort. Lotus 19 (1960–1962): Mid-engined sports racer, known as the "Monte Carlo"
Lotus 26 (1962–1971): Production street sports car, the original Elan. Lotus Elan (Lotus 45) (1966–1974): Convertible (Drop Head Coupe), a version of the original Elan with a revised body style. This version had permanent side window frames. Lotus Europa (Lotus 54) (1968–1970): Series 2 "Europa" production car. Lotus Elite (Lotus 75) (1974–1982): Luxury 4 seat GT, "Elite II"
Lotus Elan M100 (Lotus Elan (Type M100)) (1989–1995): Front-drive convertible Elan. Lotus Carlton (Lotus 104) (1990–1992): Lotus Carlton: Tuned version of the standard Vauxhall saloon. Lotus 109 (1994): Formula One, Last Lotus F1 car. Lotus 118: Lotus M250. Two-seater concept car. Unveiled in Autumn of 1999 as a mid-range sports car, project was canceled in 2001. Lotus Esprit: A mid-engined sports car, launched in the early 1970s. It was styled by Italian designer Giorgetto Giugiaro. The Esprit started with a light, 4-cylinder design. It had several version with turbo-charging and electronic upgrades. Final version had an advanced V8. The last Lotus Esprit rolled off the production line on 20 February 2004, after 28 years in production. A total of 10,675 Esprits were built since production began in 1976. Lotus Europa S: The Grand Tourer (GT)-inspired two-seater. Based on the same chassis as the Elise and Exige. Powered by a Lotus-tuned variant of the turbocharged four-cylinder engine which powers the VX220. The Europa has been criticized in the motoring press for being expensive and for lacking equipment and practicality compared to rivals like the Porsche Cayman. Range Extender Engine. This all aluminum, 1.2 liter, four-stroke, engine. It is designed to only turn an alternator The alternator is connected directly to the crankshaft. This will generate electricity for series-hybrid cars. Lotus Engineering Limited, is an offshoot of Lotus Cars. They consult with other companies that build car and car equipment. The APX (also known as the "Aluminum Performance Crossover") is an aluminum concept vehicle revealed at the 2006 Geneva Motor Show. It is built on Lotus Engineering's Versatile Vehicle Architecture (VVA). The VVA design will be used in a new mid-engined sports car for Lotus cars. The APX is a high performance 7 seat Multi Purpose Vehicle. It is four-wheel drive and has a front mounted V6 engine. Lotus Talbot Sunbeam – Talbot's hot-hatch rally car of the early '80s. 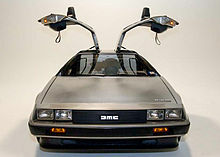 DeLorean DMC-12 – Redesigned the original concept car. Used many of the material and manufacturing techniques used by Lotus in the Lotus Esprit. Vauxhall Lotus Carlton (also Opel Lotus Omega) – At the time (early 1990s) this was the fastest saloon car available. Top speed was over 170 mph (274 km/h). The 1991 Dodge Spirit R/T – Used an engine with a 16-valve double overhead camshaft head designed by Lotus. Produced over 220 hp (160 kW). Vauxhall VX220 (also Opel Speedster) – Built by Lotus and based upon the aluminum chassis design as the Lotus Elise. Lotus styled and assisted with the engineering of the Tesla Roadster, an electric sports car based on the Elise, as well as licensing some technologies to Tesla Motors and constructing the Roadster at their plant in Hethel. Lotus was responsible for most of the design, development, and testing, of the LT5 DOHC V8 powerplant for the Chevrolet Corvette ZR-1. Lotus designed, developed and tested the GM Ecotec engine and its variants. Lotus was responsible for various aspects of the Sinclair C5 electric tricycle. Lotus was responsible for the suspension calibration of the Toyota MR2 Mk. I, the Toyota Supra Mk. II and Mk. III, the Isuzu Piazza, the Isuzu Impulse as well as newer Proton models. Lotus was responsible for the development of the Campro engine together with Proton, as well as its variable valve timing system, the Cam Profile Switching (CPS). Currently available in the 1.6-litre and 1.3-litre variants, the Campro engine now powers most of Proton's newer models. Lotus has worked on the suspension of the Mahindra Scorpio to make it more stable at high speeds. The Dodge EV concept electric vehicle from Chrysler is based on a Lotus Europa S.
The Hennessey Venom GT a soon to be released hypercar is to be based on the Lotus Exige. 2009: Range Extender engine. This all aluminium, monoblock, 1200cc, four-stroke engine is specifically designed to turn an alternator for series-hybrid cars. The engine is small and light having three cylinders and no detachable cylinder head. 2010: Limo-Green project with Jaguar Cars. Lotus provided the Range Extender engine for a prototype XJ series-hybrid car. The car returned 58 mpg (imperial) running off the range extender alone. 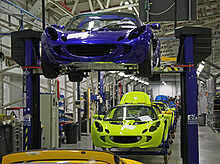 Lotus plans to enter the electric vehicle race, CEO Michael Kimberley told the Financial Times . "Don’t be surprised to see an electric Lotus shortly,” he said, adding that a concept version could debut as early as March 2009, at Geneva Motor Show. Lotus is now front and center in the electric-car arena. Lotus did not reveal details about the car or the engine but discloses that it will go for 300 to 400 miles (640 km) and it will really live up to the expectations of being one of the best electric cars in the world. Tesla Motors, a likely rival for Lotus if its plans go through, has also turned to contractors for parts of the all-electric Roadster. Of note however, is the fact that Tesla currently obtains the chassis for their Roadster from Lotus as do Dodge for their EV because of the heavy weight of the batteries in an EV and Lotus's widely known low weight and sharp handling characteristics. While only 10% of the parts of the Tesla Roadster are shared with the Lotus Elise, Lotus is responsible for approximately 40% of the overall content of the car. ↑ "The chapman legacy". Lotuscars.com. Group Lotus PLC. Retrieved 2011-02-02. ↑ "General Question". gglotus.org. Golden Gate Lotus Club. Retrieved 2011-02-02. ↑ "Lotus History". 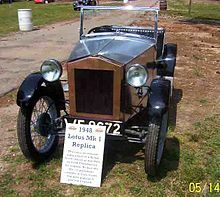 historiclotusregister.co.uk. Historic Lotus Register. Retrieved 2011-02-02. ↑ "Colin Chapman and Lotus Cars". bbc.co.uk. BBC. 2002-11-05. Retrieved 2011-02-02. ↑ "1986, High-Performance Lotus is Brought In". gmheritagecenter.com. General Motors. Retrieved 2011-02-02. ↑ "Malaysia's Proton aims to turnaround Lotus by 2015". businessweek.com. Bloomberg L.P. 2010-06-23. Retrieved 2011-02-02. ↑ Kaluski, Kamil (2009-06-23). "Magazine spotlight: proActive, The Official Industry Newsletter of Lotus Engineering". carguydad.com. Retrieved 2011-02-02. ↑ , retrieved 04 Oct 2010. ↑ "Supercharged 2007 Lotus Exige S bound for U.S. - Car News/Sports Car Central/High Performance/Hot Lists/Reviews/Car and Driver". Car And Driver. Retrieved 2010-09-30. ↑ "2006 Lotus Exige - First Drive Review/The Coupe Coop/Car Shopping/Hot Lists/Reviews/Car and Driver". Car And Driver. Retrieved 2010-09-30. ↑ "Elise Performance". Caranddriver.com. Retrieved 2010-09-30. ↑ "ExosbyLotus". exosbylotus. Group Lotus plc. Retrieved 2011-02-26. ↑ "Lotus 125 'Ultimate Track Car' to Debut at Pebble Beach Alongside Elise SC RGB Edition | AutoGuide.com News". Autoguide.com. 2010-08-05. Retrieved 2010-09-30. ↑ Abuelsamid, Sam (2010-06-22). "Lotus and Fagor Ederlan Group to produce range-extender engine — Autoblog Green". Green.autoblog.com. Retrieved 2010-09-30. ↑ "» Home - Lotus Engineering". lotuscars.com. Retrieved 2010-09-30. ↑ "Tesla Motors - Leadership". Archived from the original on 25 February 2007. ↑ "Jaguar UK - Jaguar International". Jaguar.com. Retrieved 2010-09-30. ↑ 25.0 25.1 25.2 Garthwaite, Josie (2009-01-05). "Lotus to Build Electric Vehicles". Earth2tech.com. Retrieved 2009-06-22. ↑ 26.0 26.1 "Lotus Electric Sports Vehicle Coming! | Lotus Sphere". Lotusphere2007.com. 2009-01-10. Retrieved 2009-06-22. ↑ 27.0 27.1 "Future Jaguar XJ May Cut CO2 Via Lotus 'LimoGreen' Project". GreenCarReports.com. 2009-02-20. Retrieved 2009-06-22. ↑ "UK Technology Strategy Board (TSB) to Award $45M to 16 Low-Carbon Vehicle Projects". Green Car Congress. 2008-05-08. Retrieved 2008-05-08. ↑ "The Queen's Awards for Enterprise 2002: international trade - Focus: Queen's Awards" (NewsBank). The Times. London: Times Newspapers Limited. 2002-04-22. Retrieved 2011-02-14. The Rinspeed sQuba amphibious roadster is based on an Elise. This page was last changed on 9 June 2018, at 09:03.